Put 2 1/2 cups flour in large bowl. Make a well in the center. Add salt in well. Pour in yeast mixture and olive oil. Stir to form soft dough. Turn dough out onto lightly floured surface and knead until smooth and elastic, 5 to 10 minutes, adding flour gradually as needed. Dough recipe makes 2 thin crusts or 1 thick crust, depending on preference. Turn dough out onto lightly floured surface and shape into 1 or 2 balls. Cover with a towel and let rest 15-20 minutes. 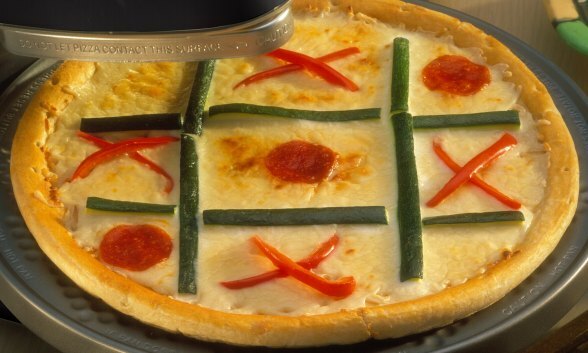 Roll or stretch dough to a 12-inch diameter and place on Pizzazz® baking pan. Brush shaped dough with 1 tablespoon olive oil. Evenly distribute mozzarella within rim of pizza. Use zucchini strips to make 2 vertical lines and 2 horizontal lines as for Tic Tac Toe. Use pepperoni slices for O’s and pepper strips for X’s. Some blocks can be left blank. Place loaded pizza pan on Pizzazz® pizza oven and bake on DUAL setting for 15 minutes or until cheese is melted and bubbly.